This rhinestone-encrusted charm bracelet captures the essence of feminine chic. Add to any look for the perfect finishing touch. Gold-tone and pink link charm bracelet with woven chains and rhin..
Add some shine to your everyday looks with this glam gold-tone charm bracelet with woven velvet insets. It features logo, heart and pearl-bead charms for a modern and feminine vibe. Gold-tone ch.. This must-have bracelet takes even your most casual looks to a chic new level with super-sparkly charms and a trendy rose gold-tone shine. Rose gold-tone chain bracelet with assorted rhinestone-.. 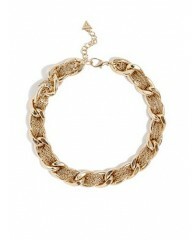 The perfect mix of hard and soft, this necklace features oversized links interwoven with delicate chains. You can wear it with everything. Gold-tone necklace with braided multi-chain design 7&..
With its timelessly feminine appeal, this gilded chain charm bracelet is the perfect gift for her (or for yourself!). Rose gold-tone chain bracelet with assorted charms 6" chain length ..
With its timelessly feminine appeal, this gilded chain charm bracelet is the perfect gift for her (or for yourself!). Gold-tone chain bracelet with assorted charms in black enamel 6" chai..
Luxurious jewel-cut rhinestones give this gilded body chain a head-turning look and versatile wearability. Gold-tone tiered chain body jewelry. Jewel-cut rhinestone accents at centerpiece. 7.5..
Drape this tough-luxe body chain over any look to instantly upgrade your style status. Gunmetal-tone tiered chain body jewelry. Rhinestone mesh pieces drape over shoulders. 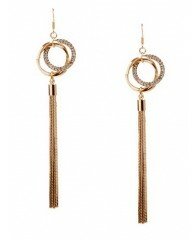 12" drop Sli..
Modern rhinestone-encrusted drop hoops and retro-inspired tassels make these earrings the season's ultimate statement pair. Gold-tone drop earrings with rhinestone-encrusted hoops and snake-..
Faux-leather and a high shine tassel make this belt the perfect finish to any look, day or night. Faux-leather belt with gold-tone chain tassel 1" width Lobster clasp Sits at waist ..